(Nanowerk News) A team of scientists from the U.S. Department of Energy's (DOE) Brookhaven National Laboratory, Columbia Engineering, Columbia Physics and Kyoto University has discovered an unusual form of electronic order in a new family of unconventional superconductors. The finding, described in the journal Nature Communications, establishes an unexpected connection between this new group of titanium-oxypnictide superconductors and the more familiar cuprates and iron-pnictides, providing scientists with a whole new family of materials from which they can gain deeper insights into the mysteries of high-temperature superconductivity. "Finding this new material is a bit like an archeologist finding a new Egyptian pharaoh's tomb," said Simon Billinge, a physicist at Brookhaven Lab and Columbia University's School of Engineering and Applied Science, who led the research team. "As we try and solve the mysteries behind unconventional superconductivity, we need to discover different but related systems to give us a more complete picture of what is going on—just as a new tomb will turn up treasures not found before, giving a more complete picture of ancient Egyptian society." Harnessing the power of superconductivity, or the ability of certain materials to conduct electricity with zero energy loss, is one of the most exciting possibilities for creating a more energy-efficient future. But because most superconductors only work at very low temperatures—just a few degrees above absolute zero, or -273 degrees Celsius—they are not yet useful for everyday life. The discovery in the 1980s of "high-temperature" superconductors that work at warmer temperatures (though still not room temperature) was a giant step forward, offering scientists the hope that a complete understanding of what enables these materials to carry loss-free current would help them design new materials for everyday applications. Each new discovery of a common theme among these materials is helping scientists unlock pieces of the puzzle. One of the greatest mysteries is seeking to understand how the electrons in high-temperature superconductors interact, sometimes trying to avoid each other and at other times pairing up—the crucial characteristic enabling them to carry current with no resistance. 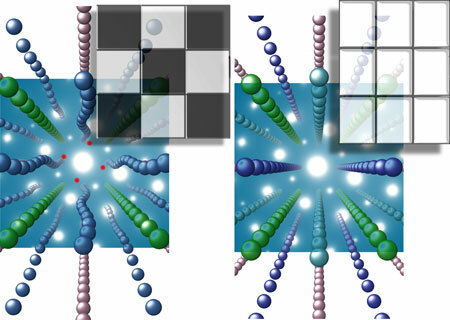 Scientists studying these materials at Brookhaven and elsewhere have discovered special types of electronic states, such as "charge density waves," where charges huddle to form stripes, and checkerboard patterns of charge. Both of these break the "translational symmetry" of the material—the repetition of sameness as you move across the surface (e.g., moving across a checkerboard you move from white squares to black squares). Another pattern scientists have observed in the two most famous classes of high-temperature superconductors is broken rotational symmetry without a change in translational symmetry. In this case, called nematic order, every space on the checkerboard is white, but the shapes of the spaces are distorted from a square to a rectangle; as you turn round and round on one space, your neighboring space is nearer or farther depending on the direction you are facing. Having observed this unexpected state in the cuprates and iron-pnictides, scientists were eager to see whether this unusual electronic order would also be observed in a new class of titanium-oxypnictide high-temperature superconductors discovered in 2013. "These titanium-oxypnictide compounds are structurally similar to the other exotic superconductor systems, and they had all the telltale signs of a broken symmetry, such as anomalies in resistivity and thermodynamic measurements. But there was no sign of any kind of charge density wave in any previous measurement. It was a mystery," said Emil Bozin, whose group at Brookhaven specializes in searching for hidden local broken symmetries. "It was a natural for us to jump on this problem." The team searched for the broken rotational symmetry effect, a research question that had been raised by Tomo Uemura of Columbia, using samples provided by his collaborators in the group of Hiroshi Kageyama at Kyoto University. They conducted two kinds of diffraction studies: neutron scattering experiments at the Los Alamos Neutron Science Center (LANSCE) at DOE's Los Alamos National Laboratory, and electron diffraction experiments using a transmission electron microscope at Brookhaven Lab. "We used these techniques to observe the pattern formed by beams of particles shot through powder samples of the superconductors under a range of temperatures and other conditions to see if there's a structural change that corresponds to the formation of this special type of nematic state," said Ben Frandsen, a graduate student in physics at Columbia and first author on the paper. The experiments revealed a telltale symmetry breaking distortion at low temperature. A collaborative effort among experimentalists and theorists established the particular nematic nature of the order. "Critical in this study was the fact that we could rapidly bring to bear multiple complementary experimental methods, together with crucial theoretical insights—something made easy by having most of the expertise in residence at Brookhaven Lab and wonderfully strong collaborations with colleagues at Columbia and beyond," Billinge said. The discovery of nematicity in titanium-oxypnictides, together with the fact that their structural and chemical properties bridge those of the cuprate and iron-pnictide high-temperature superconductors, render these materials an important new system to help understand the role of electronic symmetry breaking in superconductivity. As Billinge noted, "This new pharaoh's tomb indeed contained a treasure: nematicity."